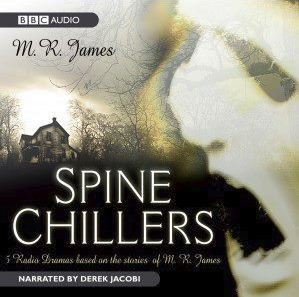 Spine Chillers carries on James’ readings by having Sir Derek Jacobi (best known to sci-fi fans for his work in the modern Dr. Who series) portray M.R. James, who introduces each of the five audio drama adaptations of his stories as if the listener is a visitor to his study. Things start off with “Oh, Whistle, And I’ll Come To You, My Lad,” wherein a man unwittingly summons a ghost after blowing an ancient whistle he found while on vacation. In “The Tractate Middoth,” the titular book is the object of a two interested parties, one a librarian and a woman from a down-on-its-luck family and the other a scheming old man. But what of the woman’s deceased uncle, who had himself buried in a special underground chamber after he died? “Lost Hearts” deals with the story of why a man does not drink port wine near the holidays, due to a horrific series of events at the house of his previously unknown cousin. Dark forces are unleashed by a well-meaning couple when the demolish an old summer home to build “The Rose Garden.” Finally, “Number 13” has one Dr. Anderson becoming slowly obsessed with both the story of alleged sorcerer Nicholas Franken (who vanished in 1716) and the disappearing and reappearing room #13 at the hotel he’s staying at. All the performances in Spine Chillers are top-notch, and both the spooky introduction and Jacobi set the tone well. I was especially impressed with his portrayal of M.R. James, whose effective voice is spooky yet amiable. Having compared the audio drama versions to the original stories, I can safely say changes have been made. Some are fairly minor, such as the addition of the protagonist recounting the events of “Lost Hearts” to his wife years after the events, and others are fairly major, like the endings of “Oh, Whistle, And I’ll Come To You, My Lad” and “Number 13.” Speaking of which, endings are rather sudden for the most part, which is fairly annoying considering the relative shortness of each episode. In fact, I found that the original written ending of “Oh, Whistle, And I’ll Come To You, My Lad” was much more satisfying than the one used for the audio version. Overall, though, I did enjoy Spine Chillers and recommend it to anyone who wants an introduction to James’s work but does not have the time to actually read a collection of his stories. That said, listeners who tend to assume adaptations are exactly like the original stories and never seek out the originals are advised to seek out this audio book featuring many of his stories (including the ones mentioned above), all read by Derek Jacobi. Having been aired in December 2007 on Radio 4, the liner notes are much shorter than the ones included with other AudioGo titles I have reviewed. That said, they are still a highly informative and very interesting read. I checked in with the experts at the Latarnia forums and although Amando de Ossorio did have literary inspirations for his creations, the works of M.R, James were not among them. Holy crap, thanks for the great find! I can honestly say I was not expecting a definite answer to my little pondering session, so this is a most welcome surprise.